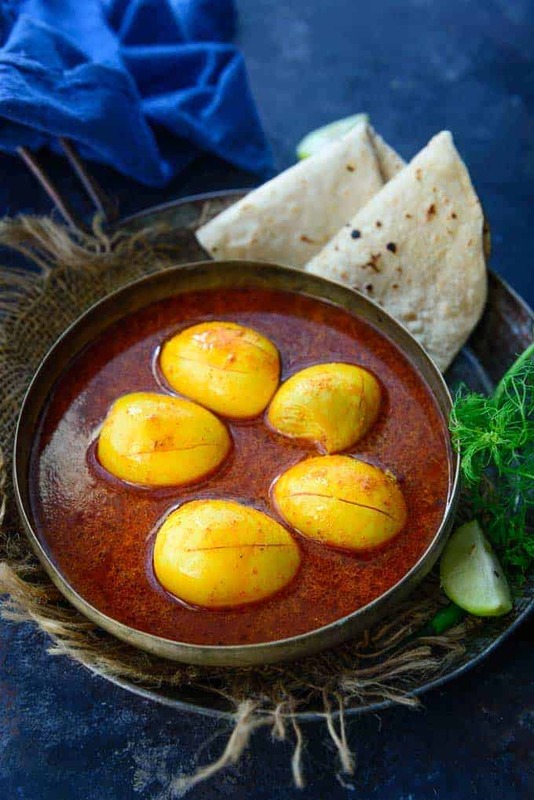 Kolhapuri Egg Curry or Anda Rassa is a spicy curry made with eggs and some special Kolhapuri spices. This dish is spicy and can be paired with roti or rice. 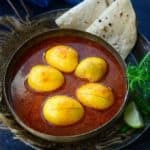 Here is how to make Anda Rassa or Kolhapuri Egg Curry Recipe. Kolhapuri Egg Curry or Anda Rassa is a spicy and very flavourful dish made using dry coconut, onion garlic spice powder and red chillies. Yesterday’s lunch was special as we had a few guests coming over. I wanted to keep it simple yet different from the regular fare and so decided to make this Kolhapuri or Maharashtrian style egg curry. It was appreciated by all and since it is an easy curry to make, I too did not have to invest any extra effort to bring it along. Paired it with some steamed rice and Laccha Paratha and the lunch was sorted. It is a pleasure to relish delicacies of Kolhapuri cuisine. Be it those various types of spicy curries or masala rice, Kolhapuri cuisine never fails to surprise my taste buds. However, out of all of them, Kolhapuri Anda Rassa turns to be one of the simplest and yummiest curries that I have ever eaten. Make slits in boiled eggs. Add turmeric powder, red chilli powder and boiled eggs in the pan. Fry for 3-4 minutes and remove on a plate. Dry roast dry coconut, garlic, cinnamon, cloves, cardamom, pepper corns, cumin seeds, coriander seeds, sesame seeds and onion until slightly browned. Add the mixture in a blender along with green chilli and fresh coriander and grind to make a smooth paste. Add some water while grinding the paste. Once the oil is hot, add cumin seeds and let them crackle for a few seconds. Add the ground masala and fry for 3-4 minutes on medium low heat. Add red chilli powder, kanda lasun masala, turmeric powder, garam masala and besan and fry for another 3-4 minutes. Add little water if the masala is burning. Add grated boiled egg, salt to taste and 2 cups of water and bring the curry to a boil. Add the fried eggs and cook for 5-6 minutes. Drizzle a little lemon juice just before serving the curry. You can also some grated or finely chopped tomatoes while grinding the masala paste.